Don’t tell us you are going to make something new, without actually doing something that makes it new. Don’t add a teaspoon more sugar to our favorite breakfast cereal, or change the packaging, just to scream to the masses that that something is “new” when in reality it isn’t. It’s a common marketing trick to make some small change to a product that has grown stale then advertise that it’s new. Sometimes it works, but most times in today’s modern world, it does not. That’s because today’s consumers are smarter than ever, better educated, better informed, and able to see right through the marketing smokescreen. That’s why it’s somewhat refreshing when someone actually does something that’s new but doesn’t shout about it all over the place. Toyota has done such a thing. They took a very good thing and made it better, new, and have said very little about. At the end of May 2016, the RAV4, now in its fourth generation, was the best selling compact SUV in America. Why shouldn’t it be? With the combination of Toyota quality, reliability and value, there is little wonder why everywhere you look you see a RAV4 prowling the streets of suburbia. For 2016, however Toyota was not content to rest on its laurels. 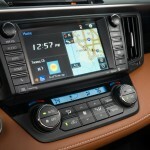 Toyota took its best selling SUV and made a mid-cycle refresh. That’s not all however. 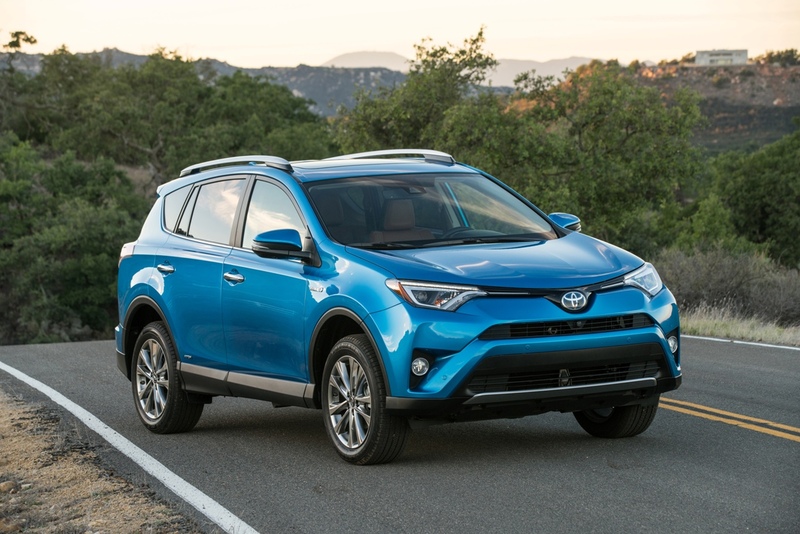 For 2016, Toyota has taken its successful hybrid platform to the RAV4. 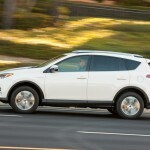 We recently spent a week with the new RAV4 hybrid, and we came away impressed. 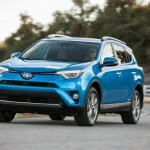 The 2016 Toyota RAV4 Hybrid carries five passengers and is available in XLE and Limited trims (there is also a new for 2016 a sporty SE trim for the non-hybrid models). The XLE trim level has many standard features including a sunroof, dual-zone automatic climate control, a rearview camera, a 6.1-inch touchscreen interface with Entune, remote power liftgate, keyless entry and ignition, on top of 17-inch wheels. The Limited trim adds exterior chrome trim, LED headlights, blind spot monitoring with rear cross traffic alert, parking sensors, heated and power adjustable front seats, adaptive cruise control, leatherette upholstery, and a 7-inch touchscreen with navigation, smartphone app integration and satellite ratio on top of 18-inch wheels. 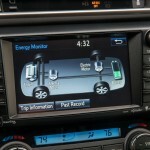 Options for the XLE include the Premium Audio package, which our XLE tester for the week had. 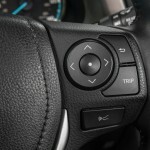 The Premium Audio package adds the upgraded touch screen and the nav and satellite radio. The XLE Convenience package adds the Premium Audio package features, along with parking sensors, blind spot and rear cross traffic monitoring. The Limited models can have the Advanced Technology package, which includes an 11-speaker JBL premium audio system and a top-down-view parking camera system. 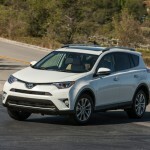 Under the hood the RAV4 Hybrid uses Toyota’s proven Hybrid Synergy Drive consisting of a 2.5-liter four-cylinder engine along and electric motors with a nickel-metal hydride battery pack. 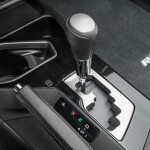 The combined output is rated at 194 horsepower with the power put to the road via a continuously variable transmission (CVT). Advertised as All-Wheel Drive, the power train automatically turns on the electrically driven rear wheels when needed (Toyota actually calls the system AWD-i). 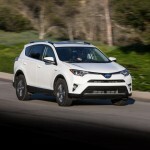 This year’s refresh gives the RAV4 a new front end, with a higher hood line and redesigned grill and a more distinctive bumper in the rear, giving the overall look a wider and higher looking stance. 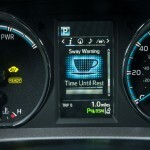 Inside there’s a new instrument cluster with a 4.2-inch info display between the speedometer and tachometer. 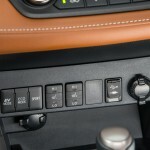 There are softer surfaces on the dash and the door panels, but the design remains essentially the same as when the fourth generation was introduced in 2013, and for good reason. The interior still looks up to date, clean and functional. 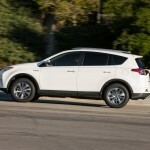 On the road, the RAV4 hybrid drives as well as the other hybrids in the Toyota line (this addition makes a total of eight). 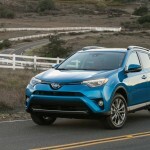 Once staunch gasoline powered car advocates, after spending time with hybrids, we’ve actually grown to understand that while most aren’t speed demons, for everyday use the hybrid works just fine; the power is adequate, and the fuel savings are a nice benefit (the EPA estimates the RAV4 Hybrid delivers 33 mpg combined with 34 city,31 highway). The RAV4 continues that story. 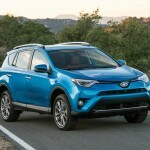 On the road the power is fine, and after getting used to the regenerative brakes, which feel a bit soft at first, the hybrid Rav4 is a winner, especially when considering its affordability. 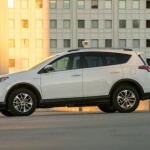 Unlike some other hybrids, which in our view are a bit overpriced because they are hybrids, the 2016 RAV4 hybrid has an MSRP (for the XLE) of $28,370. 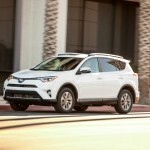 That makes the RAV4 hybrid affordable for just about anyone. 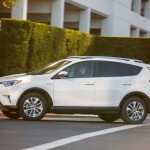 The Toyota RAV4 is already a proven winner. It is in the top 10 best selling vehicles in America at the moment. 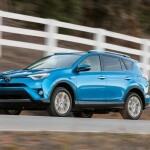 For 2016 the refresh and the addition of the hybrid, we have little doubt the RAV4 will continue to be a best seller for some time to come. It’s nice to have something new, that really is new and a bit better than before.